The robust Xerox WorkCentre 4250 is a multifunction printer aimed at small to medium sized offices with high-volume printing needs. This Xerox laser printer is feature-packed with useful technologies to make office printing more convenient. The WorkCentre 4250 can deliver 200,000 pages per month and its maximum resolution is 1,200 x 1,200 dpi. Optional finishers such as staplers and sheet trays are also available. The base model Xerox WorkCentre 4250 printer does not come with standard fax and Ethernet but does offer print, copy and scan functionality. The impressive Xerox WorkCentre 4250 printer comes with a subtle white and blue finish. The Xerox 4250 multifunction printer has an automatic document feeder, a flatbed scanner, and a 600-sheet paper tray. Paper handling capacity is expandable. For connectivity, the Xerox WorkCentre 4250 black and white office printer has a USB port on the back. 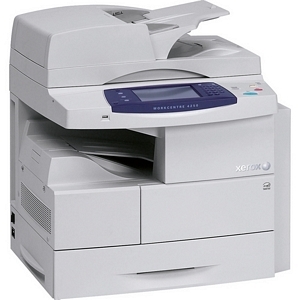 The Xerox 4250 measures 24.5 x 19 x 25.5 inches, making it easy to place in compact offices. Users can expect good quality prints, copies and scans from the Xerox WorkCentre 4250. This unit delivers good quality output at amazing speed, 45 ppm for black and white output of scans, copies, and prints. The WorkCentre 4250 mono laser printer is equipped with a duplexer and a 100-sheet automatic document feeder. Some of the special copy features include book copying and booklet creation plus edge erase and ID card copy. This multi-function printer is very easy to use and set up and toner supplied for the Xerox WorkCentre 4250 is cost-efficient with a black cartridge that will print up to 25,000 pages. The Xerox WorkCentre 4250 can be better improved with the addition of a standard Ethernet or other networking options. This unit is quite pricey yet does not come with a standard fax or finishers.